Brand New - the best ever Cortaflex for Humans! Order 2 or more bottles of ANY Cortaflex product (includes Canine) for FREE UK DELIVERY! Customers have been getting satisfaction and relief from Cortaflex for 20 years but it has now been further improved and is now called "PROTECTED CORTAFLEX – Ultra Strength". "PROTECTED CORTAFLEX – Ultra Strength" is supplied in a new clinically proven DRCAPS™ capsule which releases the ingredients over an extended time to deliver the contents into the digestive system progressively through the day. DRCAPS™ are special plant based capsules which do not dissolve completely in the stomach but progress through into the small intestine where the contents (the key Cortaflex ingredients) are slowly released and absorbed by the body. This protects the ingredients from being degraded by stomach acid, making this new Cortaflex the best ever! New "PROTECTED CORTAFLEX – Ultra Strength" provides more than twice the strength of the key ingredients than our original high strength formula – Glucosamine HCL, Chondroitin Sulphate and Hyaluronic Acid (HA). The standard dose is 2 capsules per day but, as these new capsules are twice as powerful, you may find that just 1 capsule per day works for you! Cortaflex HA Capsules contain the smaller key active isolates found in Chondroitin and Glucosamine which actually get through the cell walls into the joints where they are needed... unlike "normal" glucosamine supplements! Sugar free, salt free & gluten free. now discontinued. Old style Human Capsules have now been replaced by the brand new Protected Cortaflex Ultra Strength - see above. Description: Protected Cortaflex Ultra Strength Capsules for humans - a joint supplement providing usable glucosamine, chondroitin and hyaluronic acid for the maintenance of healthy joints. Protected Cortaflex Ultra Strength Capsules are double the strength of the Cortaflex HA High Strength capsules which they have replaced - twice the strength Glucosamine HCL, Chondroitin Sulphate and Hyaluronic Acid (a major component of joint lubricating fluid). For some people the normal Cortaflex Capsules will be sufficient but, for those wanting a quick start to more healthy joints (or for those who's joints have experienced excessive wear and tear), Protected Cortaflex Ultra Strength Capsules offer the ultimate! 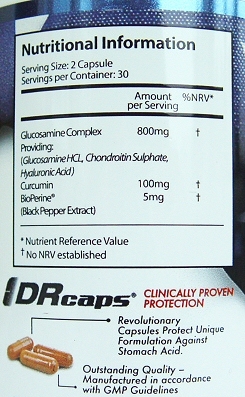 In a revolutionary DRcaps™ capsule to protect the unique formulation from stomach acid.